In 2004, Pennsylvania native Mary Groce was going through a box of family papers with her cousin Aileen when she found a sheet of old letterhead for an “Emory C. Malick, Licensee: Pilot No. 105.” Included on the letterhead was a photograph of a handsome young man in a Curtiss pusher-type airplane. Her family’s secrecy may also explain, in part, why Malick’s historical significance has been lost. 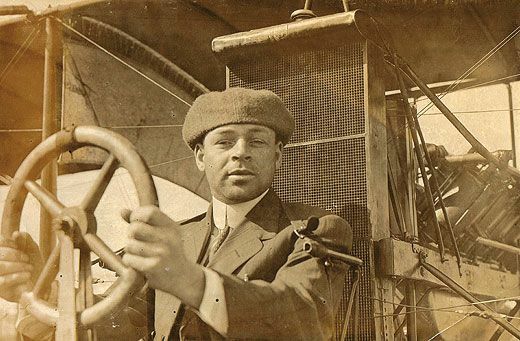 Emory Conrad Malick, who studied at the Curtiss Aviation School on North Island, San Diego, received his pilot’s license in March 1912, when he was 31 years old, making him not only the first known African-American pilot, but also the first black person to get a pilot’s license in the United States—some 14 years before aviator James Herman Banning, who was long thought to be the first. Once Groce has finished her book, she hopes to donate Malick’s papers to the National Air and Space Museum. In the meantime, she has given the Museum copies of various items. Malick later moved to Philadelphia, where he did aerial photography for the Aero Service Corporation and Dallin Aerial Surveys, and worked for the Flying Dutchman Air Service, which offered flight instruction, aerial photography, and passenger flights. Some of the family’s papers indicate that Malick helped establish Flying Dutchman with Ernest Buehl, something Groce is hoping to confirm. On a brisk March day in 1928 at a Camden, New Jersey airshow, Malick took two passengers for a quick hop in his Waco three-seater. They were barely aloft when the engine died. Malick banked to the left to avoid spectators; unfortunately, the wind caught the aircraft, and the Waco crashed. “The entire plane seemed to crumple as if it had been smitten by the fist of a giant,” reported the Sunbury (Pennsylvania) Daily Item. The two passengers were injured. In December 1958, when he was 77 years old, Malick slipped and fell on an icy sidewalk in Philadelphia. He died in the hospital. With no identification on him, his body lay unclaimed in the morgue for more than a month, until his identity could be established. Malick’s sister—Groce’s grandmother—was put up for adoption when she was two, and family history got a bit blurred. Now Groce is trying to recover information that was lost for two generations. When she does, we hope to learn more about this pilot.